On http://rpi.autostatic.com/ repository you can find some cool software packages for audio. One of those is Carla - a host for LV2 plugins. Then start qjackctl, you can do that by hitting Alt+F2 and typing in qjackctl and pressing enter. 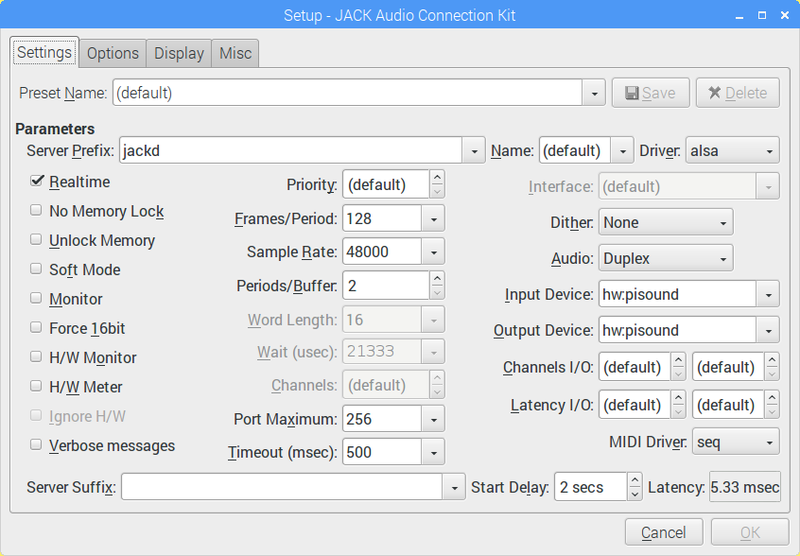 Click Configure Carla and make sure that Audio Driver is set to JACK. It will connect to the already started Jack server. For process mode I've used Single Client, but you can use any option you like. Then you can add plugins in Plugins section, and patch them up in Patch Bay section. 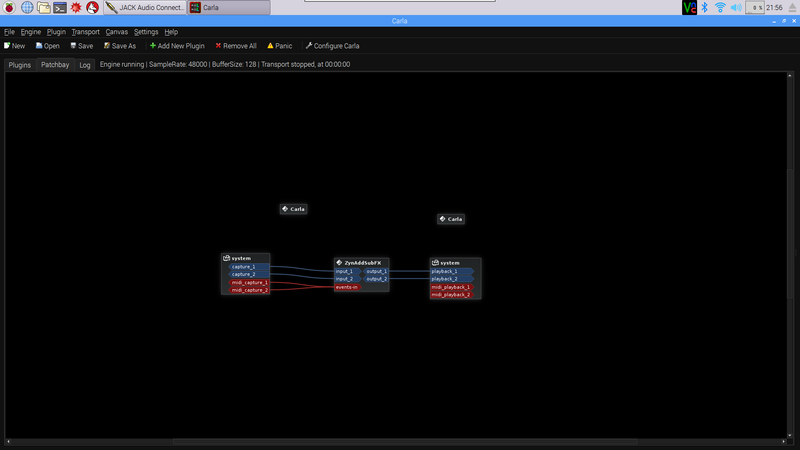 The top screenshot shows ZSynAddSubFX connected to Pisound's Input and Output, as well as MIDI data routed to the synth plugin. There's a couple of plugins readily available to play around within Carla, and you should be able to find more LV2 plugins built for Raspberry Pi to experiment with on the Internet. Using icecast and darkice you can easily setup your own radio station and broadcast whatever is connected to the Pisound input! Then we have to configure the darkice, feel free to customize to your liking. In case you're getting DarkIce: TcpSocket.cpp:251: connect error  error, see below for a workaround. For your station to be reachable outside of your local network, you need to have an externally accessible IP address provided by your ISP and you need to configure port forwarding on your router to forward requests on some port to port 8000 on Raspberry Pi. However, this is out of scope for this guide, there should be plenty of info around on how to set that up. Change 'ENABLE=false' to 'ENABLE=true' at the bottom, note the comment above, it suggests to change the password in another config file to be different from 'hackme', remember to change it in /etc/darkice.cfg too. After this, darkice should launch successfully. You can use Pisound with Volumio! Since version 2.129 (25-03-2017), Pisound's module is integrated into Volumio, so installing the latest version or updating should be enough to get 'Pisound' listed in Playback Options. Just enable I2S DACs, pick Pisound and save the configuration! We recommend switching the mixer to 'Software', if you want to control the volume within Volumio. You can use 'Hardware' mixer if using the physical volume control on Pisound. 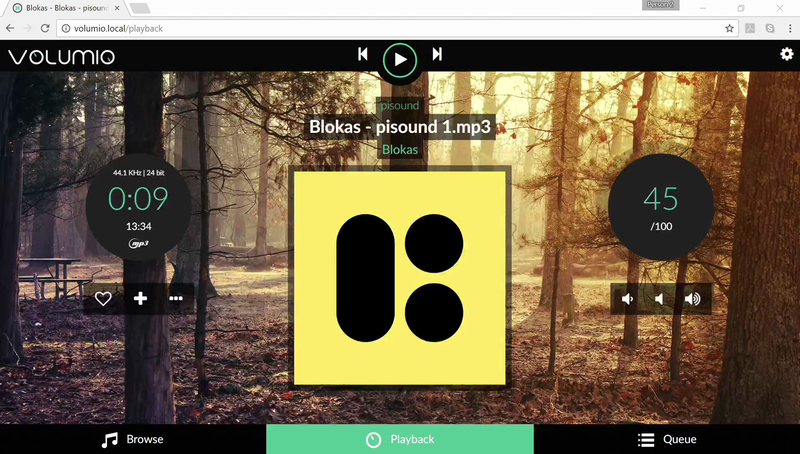 Now you can enjoy using Pisound as a network media player! If you want to add more controls to your Pisound audio projects, you can make your own MIDI controller using a couple of potentiometers, push buttons and any Arduino compatible board that uses ATmega32U4 microcontroller. Alternatively, it should be straightforward to adapt the example code to use DIN-5 MIDI ports, as the usbmidi API interface is compatible with Serial API. Go here for full instructions. Dedicated topic for Example Projects - Pisound Docs page.